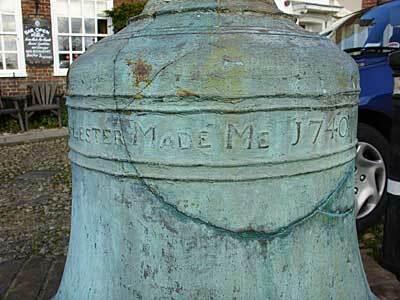 This broken bell on display in Watchbell Street, Rye bears the engraving, 'Thomas Lester made me, 1740'. Lester was the Master Founder of the Whitechapel Bell Foundry, London. This company, Britain's oldest manufacturing concern, also cast the original Liberty Bell (1752), the Great Bell of Montreal and Big Ben at the Palace of Westminster.